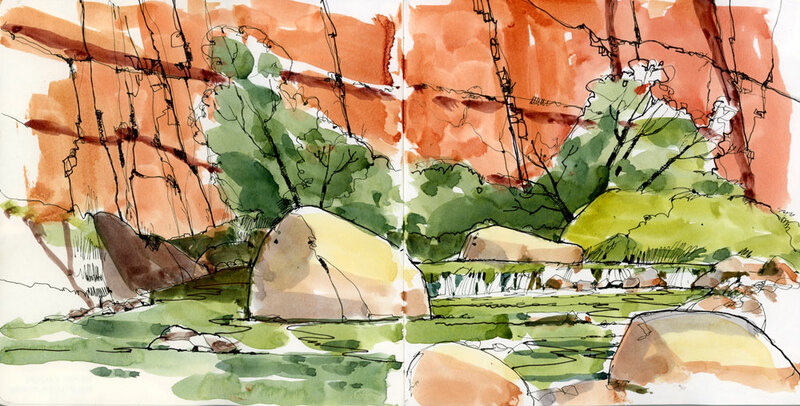 I found another sketch from my time in Utah, this one of a small rock waterfall on the Virgin River in Zion National Park. The river flows through a canyon and most people follow it as it narrows and the canyon walls get closer together, even wading through the shallow water at times. It must be very beautiful in the off-season but it was so crowded on the day I visited that you practically had to hold your breath to squeeze by people on the trail. Not my preferred way to hike! I chose instead to draw several views of the river from a little off the trail. I’ll probably use this sketch in a larger painting but change the format to vertical so I can include more of the red rock wall behind it. I’ve always wanted to go there. When did you go?…so I know when not to visit. I was there in August but I’m sure it’s much better in the fall. See the next comment. Fall is the best time to visit. Stunning views, fewer people, cooler weather. Snow can come early (late Sept/early Oct) so always best to check with the rangers what conditions are when you plan to go. I’m not Shari but I live close to Zion and spent many days there taking photos. Thanks for helping out Joan. Next time I visit I hope it will be in the off season so I can see it properly. Thanks Joam, I have heard wonderful things from many differet people…looking forward to it.